Welcome to a special Election 2012 Edition of Grain&Noise! Now, what does “Election 2012 Edition” mean exactly? I’m so glad you asked. It means close to nothing. It’s just a line I’m using to start off this week’s post. 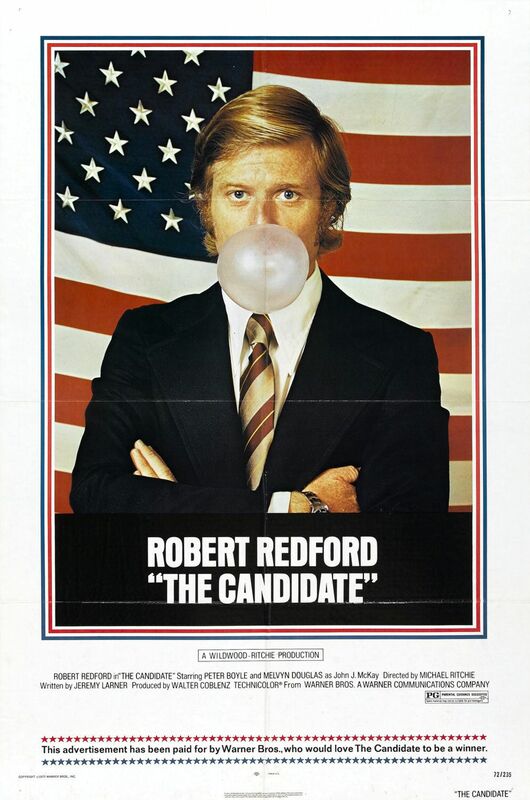 And because I’m reviewing the 1972 film The Candidate I guess it’ll be more politically conscious than other posts. Anyway, The Candidate tells the story of Bill McKay, a progressive lawyer who’s recruited to run for Senate in California against a longtime incumbent. He’s convinced to run by Marvin Lewis (Peter Boyle), a campaign veteran, under the premise that since McKay doesn’t have much chance of winning he can speak truth to power. Well, McKay quickly starts to do better than expected and, as these things often go, McKay starts to refine and limit his beliefs in order to win. The most striking element of The Candidate is how familiar all the issues still sound. The environment, welfare, a woman’s right to choose, personal responsibility vs. community responsibility. The Candidate came out FORTY years ago but the speeches by both McKay and Crocker Jarman (his conservative opponent) sound like stump speeches that could be given in the current campaign. Another equally brilliant element of The Candidate is its unpretentious, naturalistic visual style. You can see that Ritchie took a lot of cues from the 1960 documentary film Primary (one of the Direct Cinema pioneers). The camera work is loose and spontaneous. The locations feel completely lived in. The extras, I’m told, we’re all people living in the San Francisco area, some of whom even thought they were attending real campaign events. The street scenes are awash with wind and trash and lens flares. One moment that sticks out in my mind is a simple pan across a crowd attending a parade for McKay. In the foreground a young guy exhales his cigarette smoke into frame obscuring McKay as he approaches. If this were a classical studio film McKay’s approach would be clean and deliberate but here the surrounding atmosphere isn’t managed. The Candidate’s naturalistic technique also comes in handy when Ritchie needs to express the disorientation of McKay’s fist couple stump speeches, particularly one in a suburban mall. The quick zooms and unfocused camera reinforce the spontaneous, even shaky composure of McKay’s campaign, as well as give the impression that, like a real campaign, it’s all unrehearsed. In addition, the film deftly underplays a lot of the McKay campaigns’ struggles. In the final stages of the campaign McKay arrives late to a television interview and can’t stop laughing as the cameras are rolling. If this were a scene from a modern day political film (Game Change or Ides of March) somber music would sweep in to add gravity, the advisers would be huddled on the sideline whispering, the film would, in a very deliberate way, ram home the idea that McKay is beginning to crack under the pressure. Instead, there’s some brief frustration by McKay’s campaign staff, but no overwrought music, no screaming match. The camera just observes, trusting us to apply significance to the scene, rather than smashing a point over our heads. It’s also subtly implied that throughout the campaign McKay is having an affair. A svelte woman in sunglasses appears from time to time whispering in McKay’s ear, or coming down a lone hallway moments before McKay appears. I wasn’t sure what to make of this character. The affair, if one exists, is never revealed. But again, it fits into the observational style of the film. To its immense credit The Candidate doesn’t force conflict. The viewer is left to put things together. The Candidate also features some very dry, very cold comic moments. And while it’s hard to top the absurdity of our current body politic (Just check out Handguns in Church , Meatloaf and Romney, or Herman Cain), Ritchie manages some to get in a few barbs. My favorite was a scene where McKay is out on the stump in a Black neighborhood. He’s encouraged by his team to shoot some hoops with the local kids. But when the kids the see a group of white politicians jogging onto their court they turn and run. There’s another excellent bit where McKay goes down the beach to talk with the “freaks”. And by “freaks”, the film is referring to young people with long hair. Man, remember when long hair was a source of tension between generations? Like there’re all these songs from the 60’s and 70’s about getting a haircut. I guess haircuts can still cause minor problems, maybe? My brother occasionally rocks a mohawk and even I give him grief about it. But let’s be honest, does a mohawk, or muttonchops, or a box fro, really look any more absurd than a comb over? Probably not. Finally, there’s an interesting comparison to be made between Robert Redford’s career and the career of someone like George Clooney. Both started as heartthrob actors and slowly moved into directing. Furthermore both have used their clout to make “social pictures”. And finally these social pictures usually feature themselves in the lead, and their performances are typically characterized, fair or not, as static and wooden. Robert Redford in my mind serves as the archetype of the committed Hollywood progressive. Whether it’s confronting the prison system in Brubaker, communist hysteria in The Way We Were, Watergate in All the President’s Men, even land rights in The Milagro Beanfield War, Redford has been an unabashed leftist since the beginning. The Candidate ends with one of those rare moments that remains as telling today as it was forty years ago. In the final scene of the film the election results have been tallied, and despite it all, McKay has beaten Crocker Jarman. As his campaign celebrates, McKay escapes the crowds and pulls Lewis aside in an abandoned hotel room. There, sitting on the edge of a desk, with dread slowly creeping across his face, McKay looks up and says “What do we do now?”. Lewis is confused. McKay repeats the question “What do we do now?”. It’s a perfect, dead pan, ambiguous ending that captures the ultimate truth of our political system. It’s all about the race. It’s all about the victory. Governing is an afterthought. The film features a surprising performance from Peter Boyle. I’ve noticed that people with Boyle as a last name, Peter Boyle, Susan Boyle, Danny Boyle, tend to resemble actual boils. The Candidate is particularly relevant now with the death of George McGovern, one of the last huge liberal icons. It seems like all these unabashed liberals from the 70’s have been replaced by less vibrant progressives. Bummer. And lastly, the moment we’ve all been waiting for…Grain&Noise officially endorses Obama! What a surprise! Not only does he value equality, decency, social justice, and pragmatic foreign policy, he can sing as well! See, that wasn’t so bad.